The Tokyo autumn season presents a quandary for even the most seasoned of fashionable Tokyoites—not only because the length of what is considered to be “autumnal” varies by up to a month, but also because the temperature is given to fluctuate on an almost daily basis. As such, the question of investing in light layers to match the season is one closer to a gamble than an investment. The shops may be packed with outers in paper-thin leather and barely-there cotton and flax, but realistically, how many days are you going to get out of them? For the office-bound, you might even be able to count the hours! The solution is to go for an autumn outer that can double as a layer come winter. So waistcoats, cardigans and gilets are all in—just make sure you can wear them under an outer come winter and you’re good to go. Say “Japanese men” and the first image to come to mind is most likely that of the salaryman: a bestragled, besuited figure increasingly devoid of the romance associated with the dauntless go-getter of the 1980s. 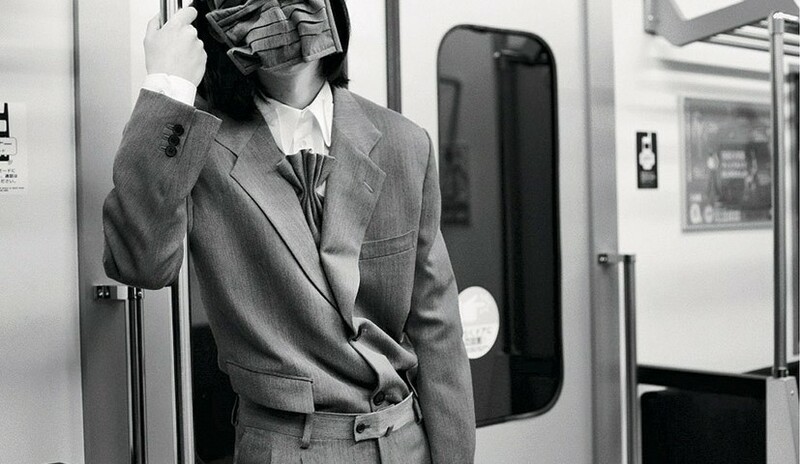 Turning this state of affairs around is avant-garde salaryman fashion revolutionary Yasuto Kimura, a man who studied fashion part-time while he himself was a salaryman working the daily grind. Even having now graduated from the prestigious Coconogacco alternative fashion school, he’s still bound to the daily grind—that is, until his designs take off. With the vast majority of contemporary Japanese menswear focused away from the tailored suit and toward streetwear, it’s refreshing to see such a progressive designer dedicating himself to the genre, even if his deconstructed and exploded salaryman suits are most likely a leap outside the dress code of most offices. “Showrooming” is one of the most maligned phenomena in modern fashion: the customer visits a shop, picks and tries on clothes, then retreats to the comfort of his or her home to place an order for the item online, saving an often-not-inconsiderable amount of money in the process. From the consumer’s perspective, they get the best of both worlds—but for bricks-and-mortar retail that can’t hope to compete with the lower overheads of online shopping, it’s a growing frustration. Offering one solution is new Harajuku boutique Plays! (www.plays.tokyo.jp), which opened late last month with a view to facilitating showrooming rather than hindering it. In-store customers will find a range of imported high brands from MSGM to Rick Owens, as well as local favorites such as Y-3 and Suzuki Takayuki. Shoppers can then try on clothes and receive advice as normal, but when it comes time to complete the sale’ they do so online through partner sites—from which Plays! recoups an affiliate fee. With plans to open similar stores in Nagoya and Osaka, this might well be the shop of the future. Even though Tokyo might be one of the safest places for experimental fashion choices that might get you ostracized (or worse) abroad, there’s still a separate time and place for indulging extremities—and fortunately next month is positively packed with chances to flex your fashion muscles, as in today’s snap. Chief among them is Mercedes-Benz Fashion Week Tokyo, which runs from October 13 to 19—so you have plenty of time to get your outfit ready!